The State of Minnesota selected the design-build delivery method to obtain the best value by utilizing a highly collaborative process while meeting an extremely aggressive project schedule. Challenged by the remodel of the historic Minnesota State Capitol that shut down public access and offices through the 2016 legislative session, state officials felt that the design-build process was necessary to design the site and spaces, source local materials, and construct the building in the 27-month timeframe. 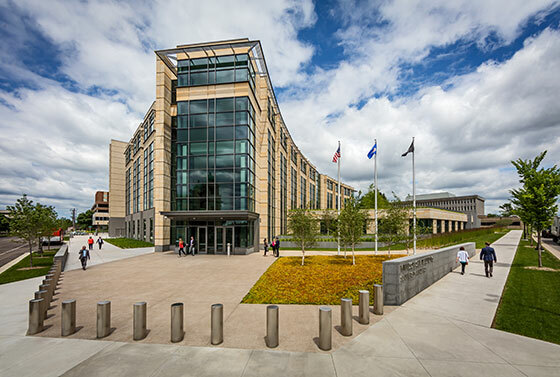 The Minnesota Senate Building is a 293,000-square-foot facility designed to improve access to the legislative process for all of Minnesota. Overcoming hurdles, including a three-month delay that changed the project scope, the building came to life in less than 27 months. The facility offers offices for 67 senators and their support staff; features work space for 360 people, a 250-seat theater-style hearing room and two 150-seat hearing rooms; and accommodates accessibility needs.